I recently worked a flight on which a passenger fell ill. Actually, the passenger fell down, as in passed out. The phone call from the cabin became the first of many, and it kept us pretty busy as we flew to Vegas. Medical events don’t happen every day for each crew, but they’re pretty common. As you might expect, the flight attendants immediately asked the passengers if a qualified medical professional was on board. In this instance, there were two of them. After the passenger was returned to her seat and regained consciousness, they questioned her about how she felt, her overall health, and any medications she might have been using. This took several minutes, but once they had some useful information, they called us. We, in turn, contacted the company and had them patch us through to MedLink. MedLink is a service provided by contracted medical professionals to the airlines. When a medical event develops on board, the doctors at MedLink will talk to the pilots, collect the information they need, and make a recommendation about either diverting or continuing to the destination. This service can be used 24 hours a day, seven days a week, anywhere on the planet. The doctors also have a database handy that will allow them to quickly determine which medical facilities might be available for a particular issue. On a domestic flight, this might seem like overkill, but on international flights over sparsely populated areas or third world countries, this information can be critical. In our case, it helped that we had medical professionals on board whocould help process the information from the passenger and provide an objective, professional analysis of her condition. In our case, we split the various communications duties between us. I handled ATC communications and took the calls from the cabin while the captain handled communications with the company and MedLink. Had the ATC workload become too great, I would have simply asked them to stand by. Once the company and MedLink were taken care of, I stuck with ATC and the captain took over all secondary communications. MedLink and the folks in the cabin recommended that we press on based on the passenger’s condition. We consulted with the company and the doctors on the ground to determine the best diversion alternates for our situation if the need might arise. We were flying over an open array of farmland with no large cities immediately available. For several minutes, the best option would actually be behind us. Beyond that, we could at least deviate forward. It has happened again: Last week, a passenger was dragged off a Southwest flight. Unlike the infamous United incident a few months ago, this passenger was carried off by police officers, and there is no “it wasn’t our flight, but one of our regional partners” argument to be made. I can’t speak for what the policy is at SWA with respect to pilot actions in these kinds of incidents. Every airline has its own protocols to follow, and while the captain is generally considered the final word once the airplane leaves the gate, the final say-so is sometimes a bit murky at the gate. Gate agents don’t like having their judgment questioned after they’ve let a passenger on. Further, they don’t want to be blamed for a delay, and they don’t always know what a crew had to deal with once the doors close. That said, more than one agent has been guilt of trying to pass the buck and just get the airplane off the gate. Flight attendants are the ones who have to deal with the passengers once the door is closed. They are on the lookout for passengers who might be a problem, whether from intoxication, anger or frustration at broken travel plans, or a fear of flying or claustrophobia. If they sense that a medical issue could (or already has) materialized, they want to deal with it on the ground. In their mind, and with good reason, their preferred course of action is usually to have the passenger removed. The pilots are in an odd spot at the gate. While they are clearly the final say once airborne, they have to trust others to do their jobs before leaving. Generally speaking, if the cabin crew wants someone off the airplane, the pilots will accommodate that request, and will often risk a scene to do so. Sometimes, passengers make it easy to make a decision by acting in an inappropriate fashion. All of this said, the captain is responsible for the safety of the flight as a whole, and anything that happens on his watch can be thrown back in his face—and will be. I’ve had to deal with a few of these at-the-gate types of incidents in my career. Three stand out. They aren’t easy to deal with, they’re unpleasant for all involved, and while tact is often desired or needed, sometimes it just doesn’t help or have a place. I wasn’t there for either of these two events. The crew, in my opinion, could have taken a stronger stance by simply announcing that the flight wasn’t going to go anywhere until the passengers in question removed themselves from the airplane. This is a harsh line in the sand, but it may be the most effective choice under the circumstances. The chances are that another crew is not going to be handy to call to gate to operate the flight, and even if there is, once they hear about what is going on, they aren’t likely to step into a minefield by taking the flight. In my experience, even if the Chief Pilot’s Office got involved in something like this—either in person or on the phone—they tend to back up the pilots and agree that the flight will not operate until the offending passenger is removed. A secondary option, though one that is not always available, is to push for an equipment swap if another airplane is available. This would require everyone to deplane and move to another gate. At the new gate, the gate agents and airport police can prevent the offending passenger(s) from boarding. In the three cases that I can recall in detail involving passenger disruptions at the gate, one ended with a trio of intoxicated men agreeing to leave with no resistance when the police came on board. The second required intervention from a family member traveling with the individual in question, along with an assertive discussion with the gate agent, who felt she was going to be blamed. The last one was the most similar to the UAL and SWA incidents. The passenger was a belligerent woman who was being extremely uncooperative and verbally abusive. To allow her to stay on would have undermined the authority of my flight attendant, and could have therefore affected her safety. I had to explain to the woman that we were having her removed and why, and when she began to say she wouldn’t get off the airplane, I made it clear we’d cancel the flight outright. I had to make the same comment to the gate agent, since he was pushing us to keep her. When he realized he’d be responsible for rebooking an entire cabin of passengers versus just one, he agreed to work with us. All of this brings up another point that was lost in the shuffle of the Republic/UA debacle. Back in the day, regional airlines had their own gate agents. They don’t anymore. The agents are either contracted from a third company (and get paid around minimum wage) or are employees of the mainline brand. This often creates tension and a disconnect, because when situations like this arise, not everybody is on the same team. All anyone knows is that somebody at HQ is going to start asking questions, so everybody gets defensive. As the pilot, it is best to remember who is ultimately going to be held the accountable, and for that matter, who has the most to lose. The answer is simple: It’s us. That’s no different in a Cessna 150 or a Boeing 747. If you’re willing to exercise the responsibility of being pilot in command in one airplane, you need to be ready, willing, and able to do it in all. In either of these cases, it would have just taken one pilot to stand up and say they weren’t going to take a problem passenger. To emphasize how far this goes, the same can be said if the problem is one of the cabin crew. Fly for an airline long enough, and you’ll also have to deal with a flight attendant who shouldn’t be at work that day. Everyone knows that (almost) every professionally flown airplane has two pilots up front, and the captain is in charge. He or she gets paid the big bucks to make all of the hard decisions and take all of the glory when things go perfectly smoothly. What are the first officer’s responsibilities? First, every first officer hates the word “co-pilot,” because that is not the proper term. But moving on. At the most basic level, the FO is there in case anything happens to the captain. Twice in 2015, airline flights have diverted because of a medical issue with one of the pilots. In one case, the captain died. This is obviously not the norm, but it is a possibility, and with the increase in mandatory retirement age from 60 to 65, it’s not unreasonable to expect that more events like this might occur. From a duty standpoint, the FO does more than recite checklists and move the lever for the landing gear. Just about every airline and flight department allows the captain to “delegate” certain duties to the FO, and in most cases, it becomes a working assumption that the FO will fulfill these duties. Delegating, per se, doesn’t have to occur. For example, the walk-around is almost always conducted by the FO, and when the weather is lousy, you can pretty much guarantee that the FO will be the one trudging around in the rain and snow to check the outside. In an environment like the airlines, in which the crew is monitoring two radio frequencies on the ground, the FO will handle most communications on the company “Ops” (for Operations) frequency. This is the frequency used for all non-ATC issues, such as late-arriving wheelchairs, two passengers being assigned to the same seat, catering issues, et cetera. The captain might jump in for a maintenance issue, but the FO usually handles these as well. In the corporate world or in operations with no flight attendant, the FO is often responsible for tidying up the cabin, disposing of trash, and the like. 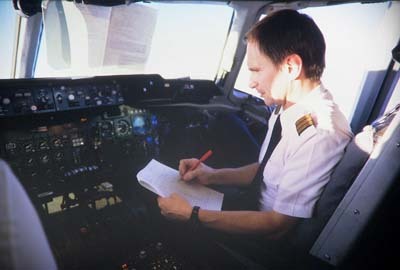 Fetching paperwork often falls on the FO as well, though at some companies the captain takes care of this so that he or she can review the fuel load and weather with the dispatcher. In the airplane, crews typically rotate turns flying, and there is no difference in the way the airplane is handled or flown, no matter who is flying. If it’s the FO’s leg, and he wants to deviate 20 miles for weather, then the deviation takes place. The FO generally will run the checklists while taxiing, because the captain is the only one with a steering tiller, but once airborne, the flying pilot is the flying pilot. If something goes awry, company procedures may dictate who does what. Most but not all airlines will allow the FO to continue flying if an emergency develops during the FO’s leg. That said, some situations may arise that require the captain to fly. This is usually a result of aircraft design, and it is not a reflection of the ability of the FO to fly. Nonetheless, the captain always has the option to take over if he or she believes that is the best course of action. I recently read a story in a nonflying publication about a group of people on a resort boat going scuba diving. The tale is related that at one point the captain had to leave his post at the wheel to go below to find his sunglasses. While he was doing so, the boat began to drift off-course enough that it was clear it would crash. The employee sitting next to the captain began to display obvious knowledge of the impending situation, but did nothing to react, even though all he had to do was put his hand on the wheel to keep the boat going straight. The author explains that it was clear that such action by an employee in the past had led to a pretty severe dressing-down, if not outright embarrassment in front of a boatload of customers. Further, when the captain finally resumed his post, there was no discussion about the danger the boat had been in. In a crewed environment of any sort—airplanes, in our case—the most important asset is trust. Each pilot must not only trust that the other knows how to fly, and that he or she knows what the job is, but the first officer especially needs to trust that the captain will welcome input that could be necessary but a bit embarrassing. Now, there is speaking up and there is speaking up. In the simple version, the FO might point out something mundane and obvious. For example, the controller issued a descent clearance and the altitude was set, but the captain forgets to actually start the descent. The FO then pipes up, the captain realizes what he didn’t do, starts to descend, and all is well. That’s easy. What’s harder is when a judgment call is required. Maybe the controller named Victor gave some bad vectors, and the approach is going to be steeper and faster than it should be. Or, maybe there is some questionable weather ahead. Or, maybe the captain is missing every radio call because he has something on his mind or doesn’t feel well. Calling for a go-around during an unstable approach sounds like it should be easy, but you’d be shocked at how hard it is for an FO to bring himself to call for the go-around. A captain who is error-prone is a difficult scenario, especially if you don’t the person well. If he or she has a reputation for it, you can at least be prepared. If not, you have to determine if the captain usually operates this way or is just having a bad day. I’ve always told my FOs that not only should they speak up, but that I need them to. The last thing I want them to do is wonder if it’s OK or if it will offend me. The truth is that it will offend me more if they don’t. After all, it always seems that certificate action follows the dumbest mistakes that are left uncorrected. I hope everyone I flew with will agree that speaking up with me was never an issue. It’s a harder skill—and it is a skill—to develop than you think. When I first upgraded, many of my captains were my age or older, and they had less reservation about pointing something out, even if it was not a big deal. But as time passed, and my FOs became much younger than me, I noticed that I had to really emphasize that my feelings would not be hurt if they said I was being dumb, or if they wanted a go-around because they didn’t like what they saw. It always seemed to me that being able to talk about it after the fact was better than the NTSB and FAA talking to my family about instead. But there are some pilots who are just “plane” jerks, and take on a very dictatorial attitude. In my personal experience, these are actually easier to deal with in some respects. Get them alone, and tell them flat out how they are coming across and that they are not being conducive to a safe environment, and (this is important) give them examples of negative behavior that they have displayed. Being called out often makes people realize that they have crossed a line or two, and often brings about the sort of behavior modification you need.